is a breeze as there is no glass enclosure to look after. 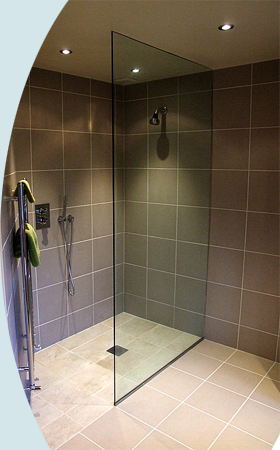 prevent splashing over into other areas where there is a basin or a toilet. This showerhead claims to provide such strong waterpressure that an aching back can be completely rejuvenated. Certainly this is the holy grail of showerhead design. On the other hand, one would imagine it would dispense a large quantity of water – a limited resource. LINK. Watch tv in the shower! This product combines two of modern man’s biggest pleasures – bathing and watching tv. The product is designed for use in wet environments, allowing tv viewing without risk of electrocution. A high end shower fixture which allows you to control the temperature digitally.